The U.S. Census Bureau has population counts for the U.S. from 1790 to 2010. I got the counts up to 2000 from Table 4 in this Census Report (Table 2 had slightly different counts for 1830 and 1940), and added the 2010 count from Wikipedia. 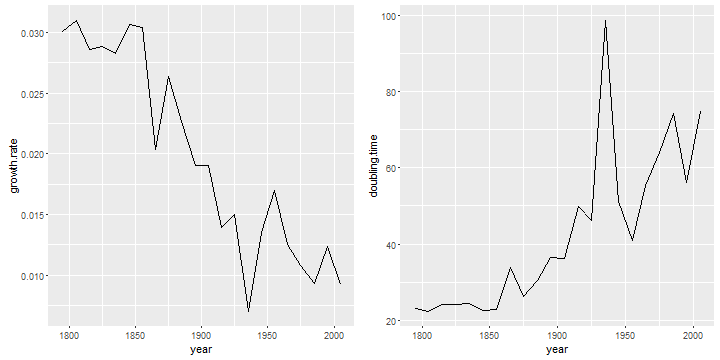 These data are in an ascii file called uspop1790to2010.dat in the datasets section of the course website. The file has two columns representing year and population. The first task is to read the data. We read the population as long to ensure we get all the digits. 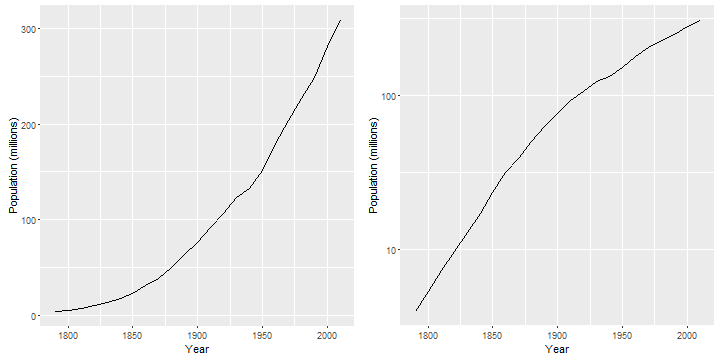 We will plot the population in millions (otherwise we get bad labels) using absolute and log scales.
. label var pm "Population (millions)"
So the U.S. population grew by 27,323,632 between 2000 and 2010. Verify that in the previous intercensal period it grew by 32,712,048. This is a mean annualized rate of growth. Note that by the time we compounded every two months we already had the correct value to five decimal places. 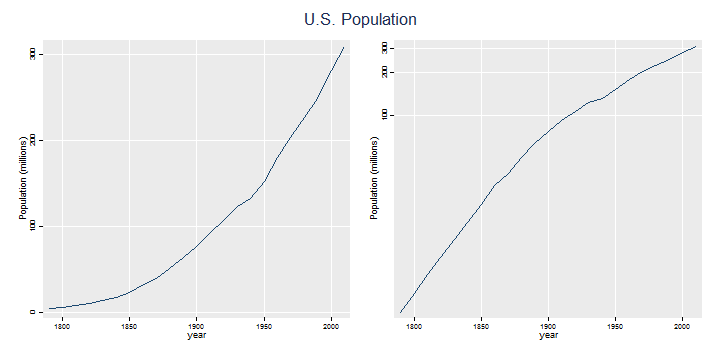 We can now compute the growth rate for the entire (census) history of the U.S. We treat all censuses as ten years apart, although this is not exactly true: over time the census has moved from August to June, and then April (except for 1920, which was done in January). If you want to do a more precise calculation the dates needed are in the reference given at the top. The graph is shown further below, combined with a plot of doubling time. We see that the growth rate was around 3% for about half the 19th century, declined steadily for almost 100 years with a pre-war dip, rebounded with the post-war baby boom, and then resumed its decline. At an instantaneous growth rate r, the doubling time is log(2)/r. 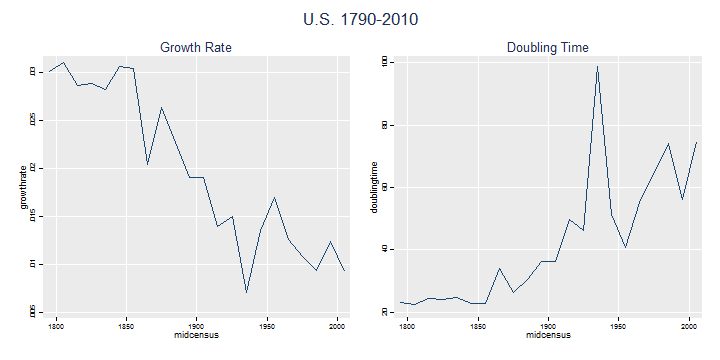 The U.S. population was doubling every 22-24 years in the first half of the 19th century, but the doubling time has increased steadily (except for a pre-war spike) and it now takes 75 years to double. Verify that in the previous intercensal period the growth rate was 0.0124 and the doubling time was 56 years.